The 6th, 7th & 8th grade Boys Ozark Soccer Teams will be recognized at 1/2 time of the Varsity Soccer Match tonight. Come see what your future Soccer Tigers look like! Ozark High School Soccer hosts the Republic Tigers tonight at Home @ the OHS Tiger Stadium. JV starts at 5:00, Varsity will follow at 6:30. The Ozark Tigers faced Springfield’s Kickapoo HS tonight at Tigers Stadium in what began as a competitive tug a war between two of the areas top teams. The Tigers started the match strong, equally matching the skilled Chiefs in possession and intensity. The Tigers, coming off a lack luster performance in Tuesdays loss to Willard, proved their abilities to play with the areas best opponents. After making several formation and defensive adjustments to start the match, the first half remained scoreless. The Chiefs athleticism was apparent in the central midfield, where possession for the tigers was difficult to retain. Both sides created opportunity in the offensive third, with the Chiefs slightly edging the Tigers in shots on goal. Senior Goalkeeper, Hunter Earnest, came up with several great saves in first half, which ended at 0-0. The second half saw the Chiefs gain an early goal, in the 46 minute, with a through ball played down the left side. Deep in the Tigers box, a well place cross was connected at the far post by the outside forward. Down 1-0, the Tigers struggled to regain their composure under the Chiefs pressure. A defensive foul at the top of the box in the 53rd minute against the Tigers resulted in a quickly taken free kick which went just past Earnest’s outstretched hands, giving Kickapoo a 2-0 lead. The experienced Kickapoo squad never looked back, generating several unanswered opportunities to take the lead to 5-0. The Tiger defense managed to limit the Chiefs on several opportunites throughout the match, with excellent efforts from Senior Ross Ruhman, Junior Alex Bauer, and Sophomore Bailey Williams, but the Chiefs presence in the midfield throughout the second half proved too much as Kickapoo ended with a 6-0 victory. The Tigers will face Republic HS tomorrow night at Tiger Stadium, and will be looking to avenge last years double overtime loss to Republic. Game time is 6:30 pm. Game @ Rogersville Friday begins @ 4:30 – Varsity plays 1st. Ozark will meet up with the Glendale Falcons tonight at Cooper Sports Complex field #2. JV begins at 5:00 and varsity will follow! Come on out & cheer on your Ozark Soccer Tigers! Adult open play today at 3pm on Turf. Grab your boots & your icy hot… Come on out & knock the ball around. OHS A. D. Terry Jameison says “no experience required” – but from the looks of it last week, some of you brought your “A” game! Ozark Varsity Soccer vs. Hillcrest @ 5pm – Tigers Stadium!!!!! 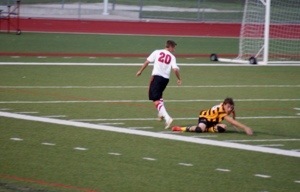 The Ozark HS Boys Varsity Soccer team faces Springfield’s Hillcrest HS tonight at 5pm at Tigers Stadium! There will be no JV game this evening. Gather as many fans as you can, and come support the 2013 team in their Home opener. The Ozark HS boys soccer team participated Friday in the first soccer Jamboree for High School Soccer in Missouri. Senior captains prepare the team for the season’s first competition. Head Coach Tom Davidson, a long time proponent of the Jamboree in Varsity Soccer got his wish this past Friday, where soccer programs across the Ozarks participated in Jamborees, similar to those held during football preseason for many years. Ozark started strong in the jamboree with a 4-0 match over Cassville and a 1-0 match against Rogersville. The Ozark JV team saw some brief action during each of the partial matches as well allowing both teams get into match form. Greenwood got the upper hand in the last match with the only score, gaining a deflection goal following a great save by Sophomore goalie TJ Shelton. Ozark had some great opportunities in each of the 3 – 25 min matches. Goal scorers for the Jamboree included Senior Sam Gunnels, Junior Hunter Wallace, and Sophomore’s Mason Shelor and Bailey Williams. I know we said an email would go out this morning but our Internet has been out since 4am. It will send as soon as it’s up and running! Thanks. Ozark vs Kickapoo game canceled for tonight. Coach Davidson & Coach Hodge are trying to find a reschedule date. Will keep you posted.